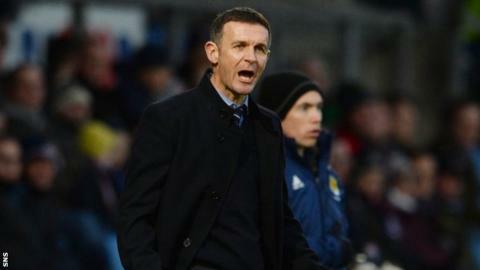 Manager Jim McIntyre concedes that Ross County cannot afford to slip further behind in the race to avoid relegation. County lie six points adrift of Motherwell and St Mirren at the bottom of the Scottish Premiership, ahead of Saturday's trip to Aberdeen. "It makes it all the more difficult; it puts more pressure on you if you do fall further behind," said McIntyre. "You want to be gaining on them not just staying the same; building some sort of momentum." McIntyre has been busy reshaping the squad he inherited from Derek Adams in September. "We've made nine signings and moved seven on," he told BBC Scotland. "From my point of view, I'm happy with the squad I have and firmly believe we're good enough to get out of trouble." Aberdeen have the chance to draw level on points with league leaders Celtic this weekend. And McIntyre believes the prospect of taking on Derek McInnes's side is every bit as challenging as playing at Celtic Park, where the Staggies achieved a 0-0 draw in December. "Aberdeen have done exceptionally well, especially at Pittodrie," he added. "Derek has built a very good squad and obviously he's added to that this week with a fantastic signing in Kenny McLean. "We know it's going to be difficult but we also know if we play to our capabilities we've got a chance in the match." Given Ross County's perilous position, it is surprising that they have only lost one of their last eight away Premiership fixtures, a run that gives McIntyre encouragement. "We've got to play like we did against Inverness," he said. "We've got to have everybody at it. We know we're more than capable of that. "Our away form has shown that over the last six, seven weeks. We're doing a lot of things well away from home and we need to do all of them to threaten Aberdeen. "You're always looking to win. You want to get the three points. "Anytime you pick a point up on the road it's a good point, as long as you start capitalising at home, and that's where we know in the next six weeks we've got to up the ante."